Garbage is picked up every Monday and recycling is picked up every other Monday. 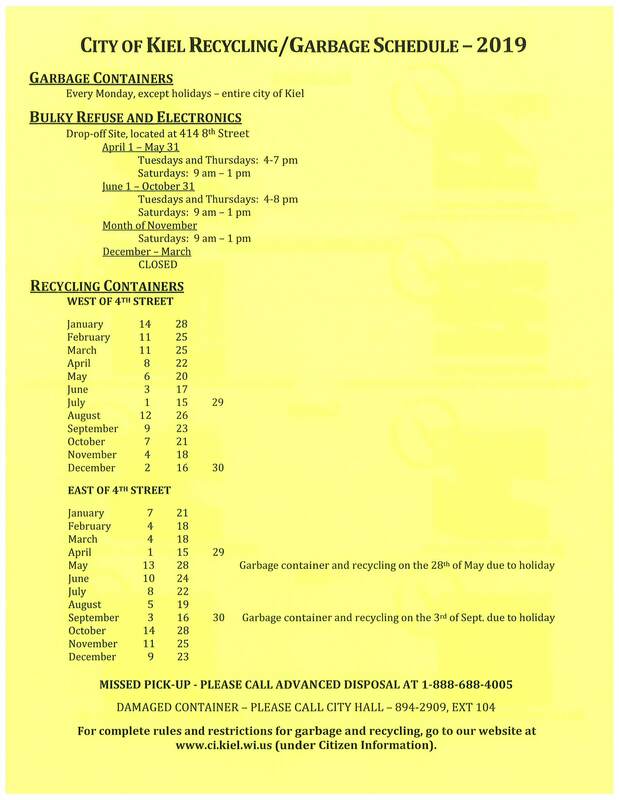 To view specific dates, please check the garbage and recycling schedule posted below. If you experienced a missed pick-up or your container was damaged, or if you would like to change the size of your garbage container, please contact Janelle at (920) 894-2909 ext. 104. Make sure containers are in the terrace, not on the curb or in the street. Be sure containers are not placed under any fixtures or structures that could obstruct pick up. Containers must be closed completely, not open or raised. Do not wait to put out containers, they must be out before 6 AM. Cut boxes to 2' x 2' or smaller. Items such as furniture, appliances, and other bulky items that do not fit inside of the garbage and recycling containers can be dropped off at the Kiel Drop-Site, located at 414 Eighth Street. These items must have the freon removed by a certified technician and stickered to that effect before they will be accepted at the drop-site. Contact local waste haulers or appliance dealers for freon removal. Must have the covers removed and the paint inside must be hardened before it will be accepted at the drop-site. For certain electronics, a fee is required to recycle. The fee can be paid at Kiel City Hall prior to taking the electronic to the drop site. More information can be found by calling (920) 894-2909 ext. 104. Contact your local county recycling center or dispose of during a Clean Sweep Program. Contact your local auto dealer or tire dealer for the disposal of tires. Must dispose of demolition material at your own expense. Contact your local battery dealer or waste hauler for disposal. 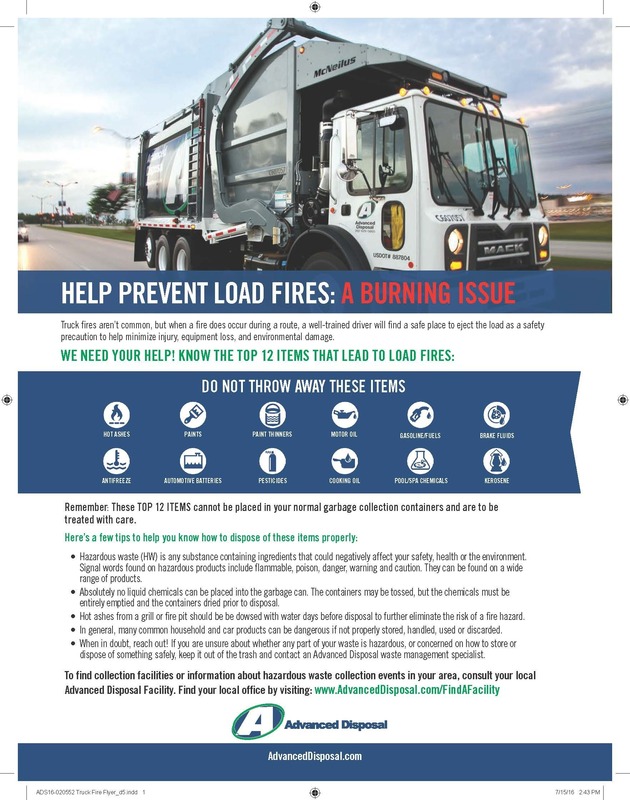 Truck fires aren’t common, but when a fire does occur during a route, a well-trained driver will find a safe place to load as a safety precaution to help minimize injury, equipment loss, and environmental damage.